Russia has upped the ante once again in Syria over the last 24 hours, launching cruise missiles from the Caspian Sea at targets in Syria. Meanwhile, information has come to light about a series of intercepts made on U.S. Predator and Reaper drones by Russian fighters operating all over the war-torn country. Russia’s shadowing and intercepting of U.S. drones operating over Syria first appeared as a fluke to U.S. officials, but as they continued to happen it became clear that Russia was actively searching for the defenseless unmanned surveillance aircraft. These intercepts have supposedly occurred over ISIS’s stronghold in Raqqa, the embattled northwest city of Aleppo, and near the Syrian-Turkish border, around Kobani. U.S. officials speaking to Fox News stated that the aircraft “flew very close, but did not impede the drone flight.” Whether this tactic is born out of curiosity or used for intimidation purposes remains unclear, although intercepting a U.S. drone is far safer than attempting to do execute such a maneuver with U.S. or coalition armed fighter aircraft. As such it seems like Russia is carefully choosing its aerial targets to investigate, at least for now. Still, that does not mean that the situation is not being being unilaterally helped by coalition forces that are willingly de-conflicting their flight paths from those of Russian aircraft. The skill of Russian tactical aircraft crews has been far less than stellar over their first week of combat operations. Multiple incursions into Turkish airspace have occurred and at least one Assad-aligned aircraft, a MiG-29, acted in a very friendly way towards Turkish F-16s patrolling on their side of their shared border with Syria. Meanwhile, a 1,000 miles to the east of Syria, in the Caspian Sea, Russia fired off 26 cruise missiles at 11 targets in Syria. Russia claims their missiles all hit their targets as planned with no civilian casualties. The use of cruise missiles launched from the Caspian Sea is puzzling as they had to fly over Iran and Iraq in order to reach their targets in Syria, a feat that Russia says was coordinated with both countries. Since Russia has a pocket air force deployed to Syria, and it flies all over Syrian airspace unopposed, there was no need to use expensive cruise missiles from a thousand miles to hit targets in Syria. Clearly the cruise missile strike was a blatant advertisement of capability and show of force on Russia’s behalf, as well as a slap in the face to the U.S. and its coalition which is flying constant combat operations over Iraq. Above all else, it was a clear reminder that Putin is willing to do what he wants, when he wants in a region that has been historically dominated by the U.S. and its military over the past few decades. 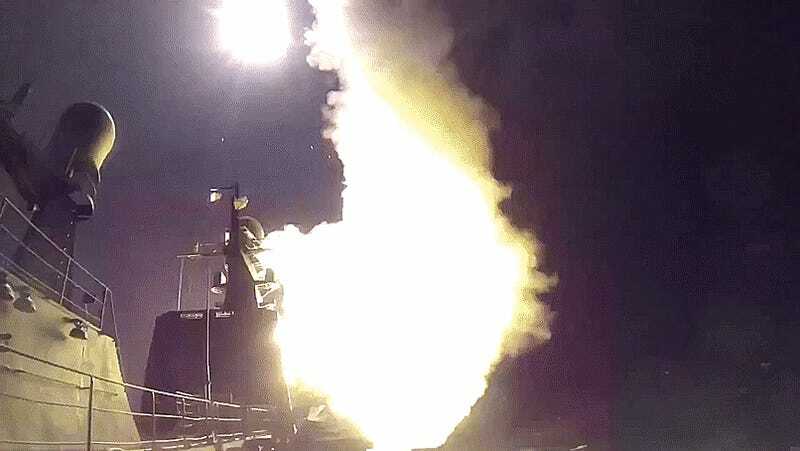 The missiles involved in the long-range attack were the new Kalibr-Nk terrain-following cruise missiles launched from the Gepard class frigate Dagestan and the Buyan-M class corvettes Grad Sviyazhsk, Veliky Ustyug and Uglich. The Kalibr-NK is and outgrowth of the successful “Klub” family of cruise missiles and is roughly analogous to earlier versions of the BGM-109C Tomahawk Land Attack Missile (TLAM). Also of note is that all the hardware used in the attack is for sale, making the peculiar long-range one heck of an advertisement to prospective buyers. All this is happening as Russia has supposedly forward deployed a portion of its Mi-24 Hind attack helicopter derivative fleet to a forward operating base near the increasingly violent city of Homs, about 100 miles from their current base outside of Latakia. In addition, Russia has setup long-range artillery rockets that can reach far from their base in Latakia, and more Russian commandos have arrived in Syria along with their armor. Although the majority of Russia’s ground forces are clearly in-country to provide force protection and to execute a protective buffer around their interests between Latakia and Tartus, it seems that more than just air power is getting primed to support an Assad-backed offensive against anti-Assad forces in central-western portion of Syria. Eventually Assad’s forces are said to be backed by Iranian, Iraqi-Shiite militia and Hezbollah fighters. As for Russian ground forces getting directly involved, the Kremlin says no, but other accounts point to the possibility that Russian soldiers will indeed be directly involved, albeit in a “semi-official” sense. This follows a similar model as the one used in Crimea and eastern Ukraine. There the Kremlin had alluded to the presence of “volunteer” Russian fighters, yet some of these soldiers were incredibly well equipped and well trained, looking and acting more like Russia’s elite special forces than soldiers of fortune. Now the question is what military capability will Moscow showcase next, and just how brutal will the fighting be once Russia’s air forces and ground elements engage in combat in support of Assad’s fighters? Things are moving so fast in the region that I doubt we will have to wait long for the answers to these questions, for better or worse.